USPC would like to highlight the National Youth Board Members for the current term. Today we would like to introduce Virginia Carpenter. Virginia is an incoming member for the 2019 National Youth Board. She is a C-2 Eventing, H-B HM member from Casanova-Warrenton Pony Club in the Virginia Region and has been an active member for 12 years. Virginia competes in polocrosse, mounted games, and eventing and is currently training her 4yr old OTTB Captain America. She thoroughly enjoys teaching beginner lessons and coaching polocrosse and mounted games. 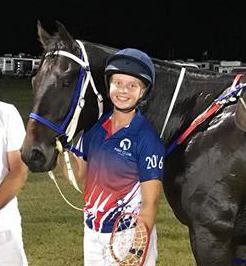 Virginia is grateful for all the opportunities Pony Club has afforded her including the 2016 International Mounted Games Exchange to Australia. She is active in the American Polocrosse Association where she and Captain America were the first pair to complete the APA Crosse-Over Challenge to bring along an OTTB in under 12 months to be able to play polocrosse. Virginia is currently studying national security and foreign affairs at Virginia Tech. She is a part of the Virginia Tech Corps of Cadets and Air Force ROTC with a scholarship to commission after she graduates. Virginia looks forward to serving on the NYB to help give back and continue to improve the organization that she owes so much.